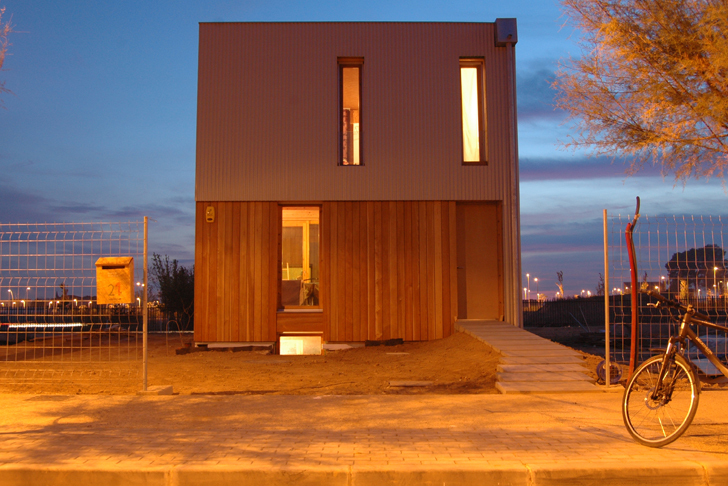 Architect Josep Bunyesc built Spain's first certified passive house (PHPP) two years ago. The home is located in Llerida, and its orientation, insulation, solar panels, materials and overall design slash energy usage by 90%. The architect designed the wooden prefab shelter to serve as a beacon of sustainability and his own family home. Josep Bunyesc’s home consists of a ground floor, first floor and a basement, where the architect has his office. 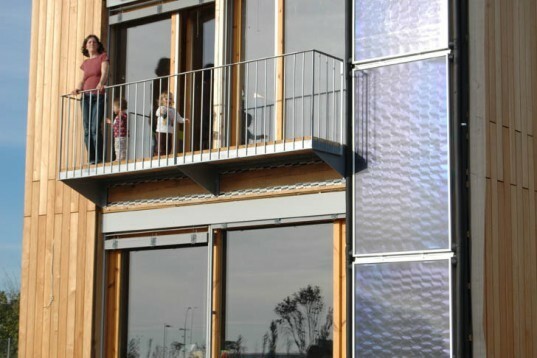 The wooden shelter with solar panels on its facade is orientated to the south to capture free passive solar energy while protecting itself from hot Spanish summers. The central patio creates a new internal southern facade, providing plenty of natural light, cross ventilation and views throughout the building interiors. The construction was quick and utilized prefab OSB boards with 7.8 inch sheep’s wool insulation, and an external breathable surface to prevent condensation. During the summer there is no need to open the double-glazed windows as a free cooling system with ducts and airshafts lowers the temps and provides enough breeze. Efficiently-built, low-energy, modern and very affordable, Josep Bunyesc’s passive shelter in Spain is a family home for life. Very beautiful home, we should all be building like that. One question, what rooms are in the south side of the building?, I heard that 'non day-time living spaces' should be placed in the south of the building so as to advoid the spikes in solar heat gain due to the intensity of the sun in Spain. Brilliant home! Liking the bare osb walls. Josep Bunyesc's home consist of a ground floor, first floor and a basement, where the architect has his office. The wooden shelter with solar panels on its facade is orientated to the South to capture free passive solar energy while protecting itself from hot Spanish summers. The central patio creates a new internal southern facade, providing plenty of natural light, crossed ventilation and views throughout the building interiors. The construction was very quickly lifted from prefab OSB boards with sheep's wool insulation and an external breathable surface to prevent condensation. During the summer there is no need to open the windows as a free cooling system with ducts and airshafts cools the space down. Quickly built, low-energy, modern and very affordable Josep Bunyesc's passive shelter in Spain is a family home for life.